Every once and a while you get a pretty good glimpse why certain airlines seem like they file Chapter 11 more than they file 10-K's. Here's a great one from today. 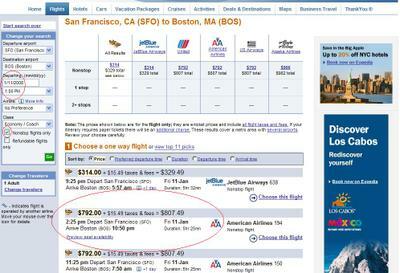 I was trying to book a one way from from SFO to BOS on January 11th. I accidentally asked for a round trip on Expedia the first time I did my search. Realizing my mistake I went back and did the exact same route (SFO to BOS), conditions (non-stop) and date (Jan 11th, 2008 outbound) but only one way. Guess what, the plane ticket was substantively MORE for a one way. I can understand it being substantively more than 1/2 a complete roundtrip but more than the total roundtrip? 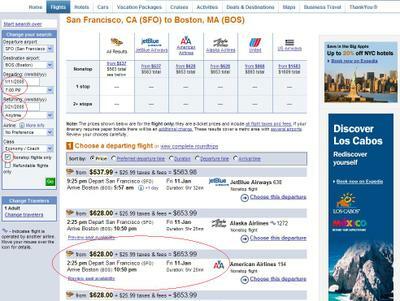 I seriously wish Expedia would let me book a double or triple round trip fare. I am pretty sure I could get this puppy down to a buck or two using that pricing logic. I even took screen shots lest you skeptics not believe me. Screen shots taken within 10 seconds of each other. One way (above) - $792.00. If anyone actually understands this pricing logic from an airline perspective I would absolutely like some education on it (leave a comment please). I decided to gain a slight statistical advantage over my other Enterprise Irregular bloggers by hedging a few days into the New Year to publish my 2008 predictions. Fortunately (and to many chagrins, I am sure), waiting a mere two days has revalidated the premise of one of my predictions: 100 dollars a barrel anyone? Its gonna be a year to remember. As a side note, and somewhat true to form, I have a number of posts related to these topics in the workshop, sitting on the easel, one coat of paint away from publishing. I would promise to try and get some regular pace to this mess in 2008 but why make a resolution you’re bound to break (I have not gone to gym yet either folks). Lastly – I apologize that so many of these things are interconnected – I can’t help it as we’re in a major phase shift right now – a sort of tech will follow the dollars will follow the tech kind of Mobius strip.